AMSOIL Dominator Synthetic 15W-50 Racing Oil (RD50) provides superior performance and maximum protection in high-performance and racing applications. Formulated to withstand the elevated RPM, high temperatures and shock-loading common to racing applications, Dominator Synthetic 15W-50 Racing Oil delivers superior performance and maximum protection in extreme conditions. AMSOIL Dominator Synthetic 15W-50 Racing Oil (RD50) provides superior performance and maximum protection in high-performance and racing applications. Formulated to withstand the elevated RPM, high temperatures and shock-loading common to racing applications, Dominator Synthetic 15W-50 Racing Oil delivers superior performance and maximum protection in extreme conditions. Its shear-stable formulation was engineered to provide maximum horsepower without sacrificing engine protection. Dominator Synthetic 15W-50 Racing Oil provides straight-grade protection in a multi-grade formulation. AMSOIL, the leader in automotive synthetic lubrication, produced the world�s first API-qualified synthetic motor oil in 1972. Trust the extensive experience of AMSOIL The First in Synthetics� to do the best job protecting your engine. AMSOIL Dominator Synthetic Racing Oil features an additive package heavily fortified with zinc and phosphorus for superior long-term wear protection. Designed for maximum durability, it ensures critical engine components are protected for the duration of the race. Dominator Synthetic Racing Oil�s superior additive technology provides unmatched durability in extreme conditions. In addition, its high levels of zinc and phosphorus additives make it ideal for street rods, muscle cars and other vehicles with flat-tappet cams. Dominator Synthetic Racing Oil�s proprietary friction modifier provides reduced friction for maximum power and cooler engine temperatures, resulting in improved lap times and longer-lasting equipment. Dominator Synthetic 15W-50 Racing Oil�s multi-viscosity design provides maximum protection in temperature extremes. Dominator Racing Oil offers excellent coldstart protection and provides less drag when engine oil has not reached stable operating temperatures. It maintains superior film strength during high-temperature operation on the track. Many oil companies produce specialty racing oils for elite groups and do not offer them to the general public. For instance, several popular oil manufacturers produce racing oils offered only to NASCAR racers. All AMSOIL synthetic motor oils are already formulated to a higher level of performance than competitors� oils, and AMSOIL Dominator Synthetic Racing Oil is no exception. 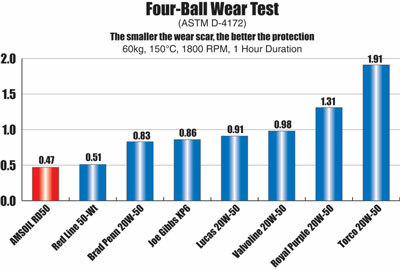 It provides maximum performance and superior protection to all racers, regardless of their level of competition. 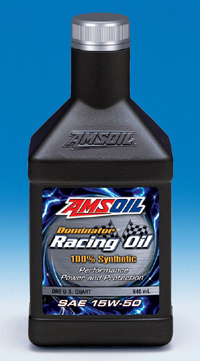 The same AMSOIL Dominator Synthetic Racing Oil that is used in the engines of AMSOIL corporately-sponsored racers, including Scott Douglas and Brady Smith, are available to everyone. AMSOIL Dominator Synthetic 15W-50 Racing Oil is recommended for high-rpm, high-horsepower, turbo/supercharged, gasoline- or alcohol-burning, nitro-fueled or nitrous oxide gas-injected applications operated under severe conditions. Applications include, but are not limited to, the following: � Asphalt Late Model � Dirt Late Model � Modified Big Block � Ford Crate Late Model � Dodge Crate Late Model � Endurance � Rally � Sprint � Truck-Pull � Aluminum Block � Marine � Other high-performance racing and street applications requiring 50-weight oil. This product is not expected to cause health concerns when used for the intended application and according to the recommendations in the Material Safety Data Sheet (MSDS). An MSDS is available upon request at 715-392-7101 or via the Internet at www.amsoil.com. Keep Out of Reach of Children. Don�t pollute. Return used oil to collection centers.